I have terrible news. I am writing to you from school. I cannot even tell you how much I would rather be at home baking all day and writing about it than sitting at school, reading about biodiversity, and trying to squeeze in baking whenever I can. It definitely doesn't help that a terrible case of senior-itus has really set in. To make matters worse, I am taking care of my little brother alone, as both my dad, who always works in Chapel Hill during the week, and my mom, who is investigating lots for houses, are in North Carolina. Riley really is not a burden at all, but having to do that little bit of extra driving- to school, to swim practice, to piano- has started to eat up the already small amount of time I have outside of school to bake. Generally, I go to bed around 9:30. I know what you must be thinking. 9:30? Who does that? Grandma! Despite my preference for an early bedtime, I needed to bake. At 8:27 last night, only an hour until I would usually be snuggled up in bed, I set out to make this cake. I would sacrifice sleep for the sweets. I had hoped to serve a slice of this cake to Riley for breakfast. We always have a bowl of fruit and some sort of starch, whether it is a muffin or pancakes or a scone. Beautiful! I thought. I could combine them into one dish and save myself some time. Unfortunately, it was unbelievably dark this morning, so I wasn't able to take a picture. I guess Riley will just be having it for breakfast tomorrow. 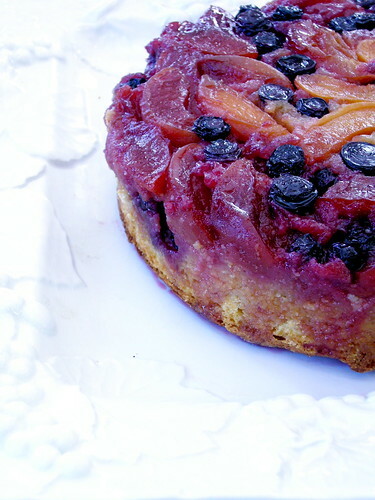 Also, I thought I would let you know that the cake was originally intended to be a plum huckleberry upside-down cake, but neither were anywhere to be found, so blueberries and apricots were next in line. First, I sliced six small apricots into half-inch slices. I cut three tablespoons of butter and plopped them down into a nine-inch cake pan. I set the pan directly onto the stove, turned on the burner to low heat, and melted the butter. I put 3/4 of a cup of brown sugar into the bottom of the cake pan and combined it with the butter. I scattered half a cup of blueberries over the bottom of the pan, layered the apricot slices around them, and tossed the remaining half a cup of blueberries over top of that. In the bowl of my stand mixer, I creamed a stick of room temperature butter and a cup of white sugar. I mixed these on medium speed for five minutes until the butter was light and fluffy. I beat in a teaspoon of vanilla and scraped down the sides of the bowl. I added two eggs, one at a time, and beat to combine. I whisked together one and a half cups of flour, a teaspoon and a half of baking powder, and a quarter of a teaspoon of salt. I mixed half of the dry ingredients into the wet ingredients and then added a half of a cup of room temperature milk to the batter. I stirred in the remaining dry ingredients, careful not to over-beat the batter. I gingerly spread the batter over the fruit, trying not to disturb the blueberries and send them rolling all around, and then smoothed the batter with an offset spatula. I slid the unbaked cake into my oven, which I had preheated to 350 degrees. I set the timer for an hour. While I waited for the cake to bake, I watched some Gilmore Girls and started to make the Champagne gelee, which I will tell you about later. The timer went off after what seemed like only a few minutes, and I took the golden cake from the oven and put it onto a wire rack to cool. Instead of removing the cake from the pan last night, I decided that it could wait until the morning. After all, I do need some sleep. This morning, I slid a knife around the edges of the cake pan and inverted it onto a cake plate. To my surprise, the cake came out with no resistance. It looked perfect! Whenever I had made upside-down cakes in the past, they had sort of fallen apart. Maybe the trick is to let it rest overnight? I can't wait to hear what Riley thinks of this cake, as I thoroughly enjoyed it. The cake itself had a nice crumb, and the caramelized fruit on top didn't hurt either. It could pair quite nicely with a number of things and easily could be eaten for breakfast, for a snack, or for dessert. Next time I make it, I may try switching out the fruits, substituting almond extract for vanilla, or even replacing some of the flour with cornmeal, just to see how it tastes. Preheat oven to 350. Melt the butter in a 9-inch round cake pan directly over stove top, over low heat. Add brown sugar and stir until sugar is thoroughly moistened. Remove from heat and cool briefly. Sprinkle half of the blueberries evenly over the brown sugar. 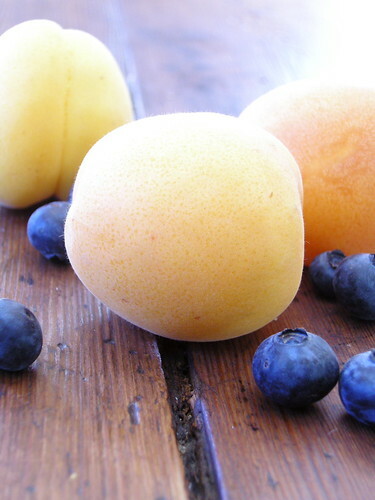 Arrange apricot slices over them evenly. Sprinkle remaining blueberries on top. Cream butter and sugar until light and fluffy. Beat in eggs one at a time. Add vanilla. Whisk together flour, baking powder, and salt in a separate bowl. Add flour in three additions, alternating with milk. Spread batter carefully over fruit. Bake for about 1 hour, until a toothpick inserted in the center comes out clean. Let cake stand for 20 minutes. 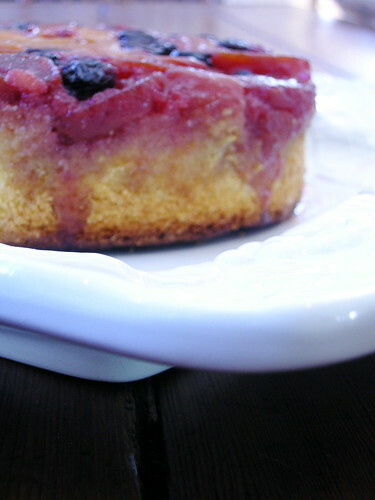 Loosen edges with a knife and invert onto a cake plate. This looks absolutely incredible! 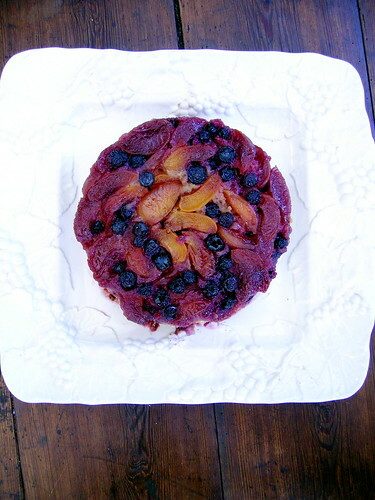 You just put me in the mood to bake a fruity dessert that I can enjoy for breakfast! I am baking this tonight for Jessica and Jackson's anniversary dinner. Yum yum!